Rip, jump and scrub your way to victory with over 35 tracks in this vastly extended version! Only the Encore edition features the brand new Rhythm Racing mode, extra outdoor Nationals tracks, and exclusive Waypoint races in open world maps. The improved game engine brings remastered HD graphics & sound, smoother online gameplay, and updated riding physics for full control. © 2015 Nordic Games GmbH, Austria. Developed by Rainbow Studios. Uses Bink Video. Copyright © 1997-2015 by RAD Game Tools, Inc. FMOD Sound System, copyright © Firelight Technologies Pty, Ltd., 1994-2015. Uses Scaleform GFx © 2014 Autodesk Inc. All Rights reserved. 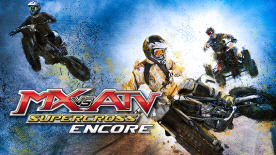 MX vs. ATV is a trademark of Nordic Games Licensing AB, Sweden. All rights reserved. All other trademarks, logos and copyrights are property of their respective owners.